IT'S TIME TO GET YOUR EAT, DRINK & BID ON! Join the community for a fun filled evening full of eating, drinking, and bidding on fabulous items! This fundraiser benefits the Greater Irmo Chamber of Commerce and enables them to continue serving the Irmo business community. This year we will raffle a Yeti Roadie Cooler valued at $300 courtesy of Allstate: The Salmon Agency. Tickets are $5 each or 5 for $20. 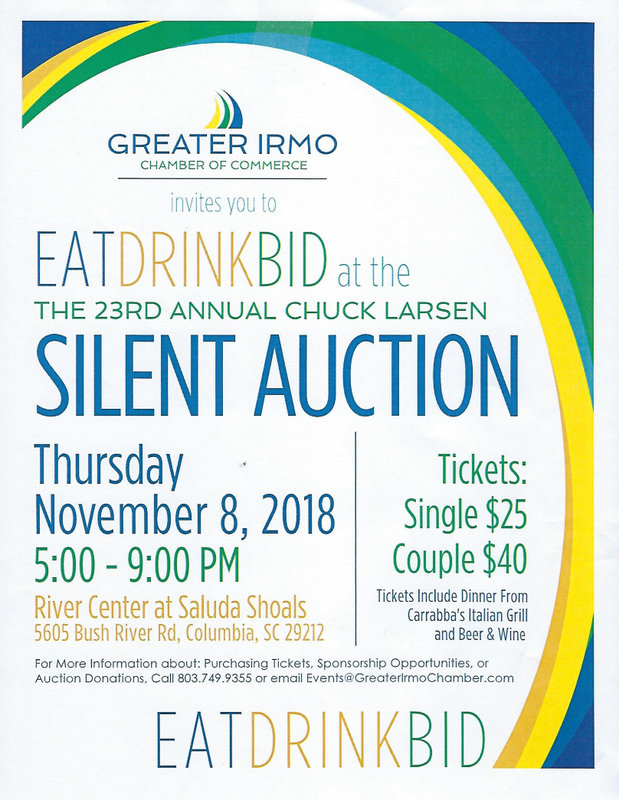 Tuesday, November 8th, 5:00 p.m. to 9:00 p.m.
For more information about purchasing tickets, sponsorship opportunities or to donate an auction item, please call 803-749-9355 or email events@greaterirmochamber.com. Get more information about the silent auction here. Find out what’s up for bidding and bid early!